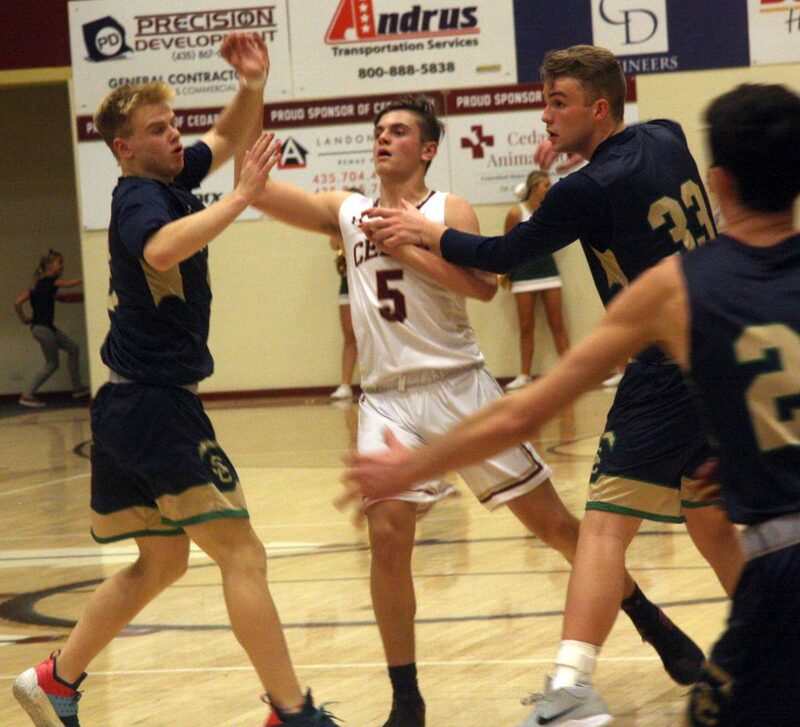 ST. GEORGE — Somebody was going to get their first Region 9 win of the season when Snow Canyon traveled to Cedar, and by more than whisker it was the Redmen. 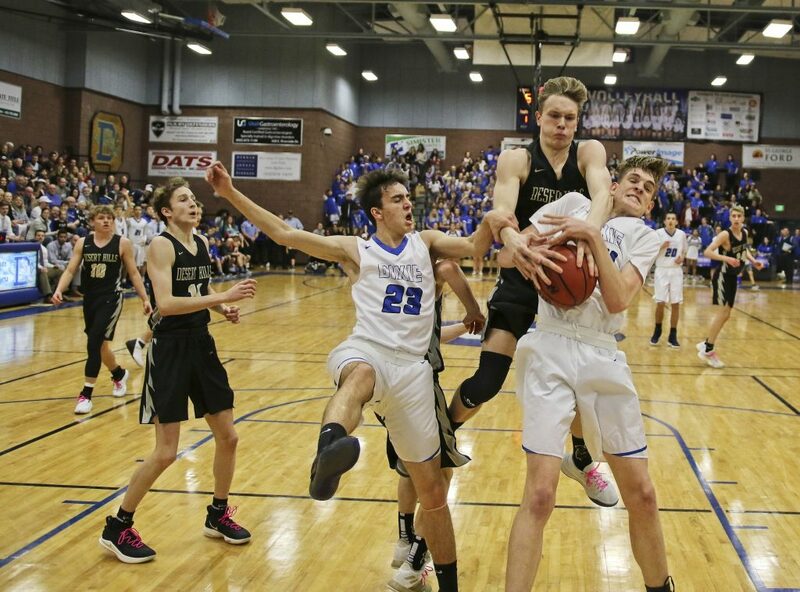 Elsewhere, Pine View dominated Hurricane to remain undefeated, while Dixie outdistanced Desert Hills to take sole possession of second place. 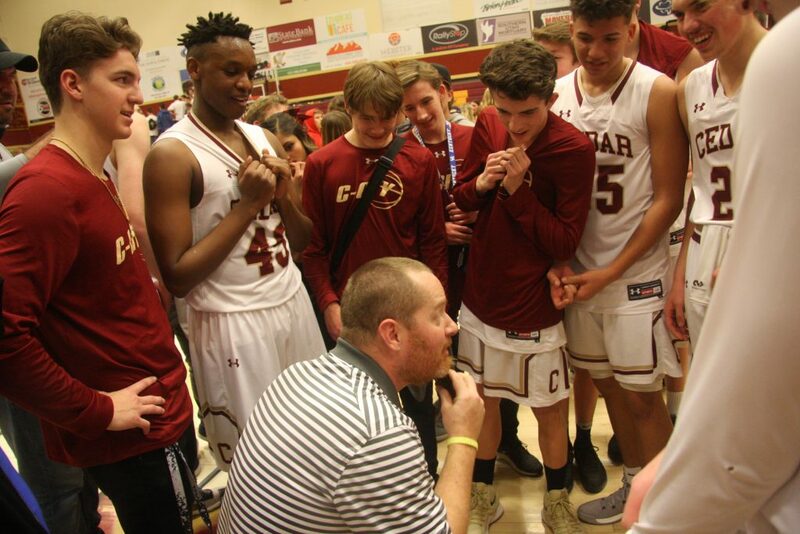 At Cedar, the Redmen picked up their first region win of the season with a 62-46 victory over Snow Canyon. 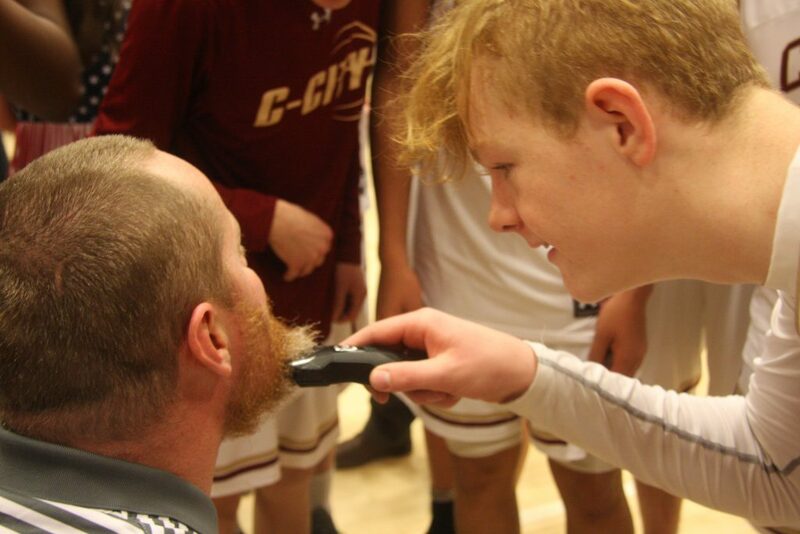 Right after the game ended, Cedar’s players surrounded head coach Russ Beck and proceeded to take turns shaving Beck’s beard with a pair of wireless clippers, much to the delight of the players, students and fans. 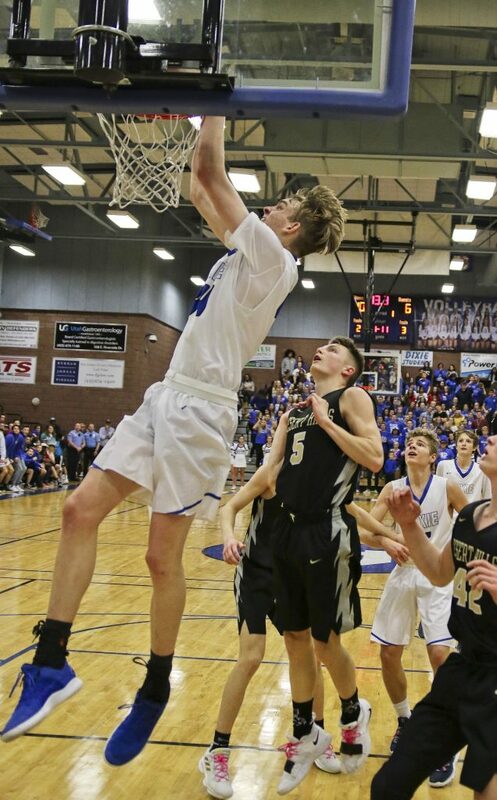 Sophomore center Dallin Grant scored 19 points in an impressive outing during his first game back since being sidelined with an injury over the past several weeks. “Just the energy that Grant gave us in practice and knowing that he was going to play, made everybody kind of feel like it was a new season,” Beck added. Cedar built a 9-7 lead in the first quarter and extended it to 24-19 by halftime. 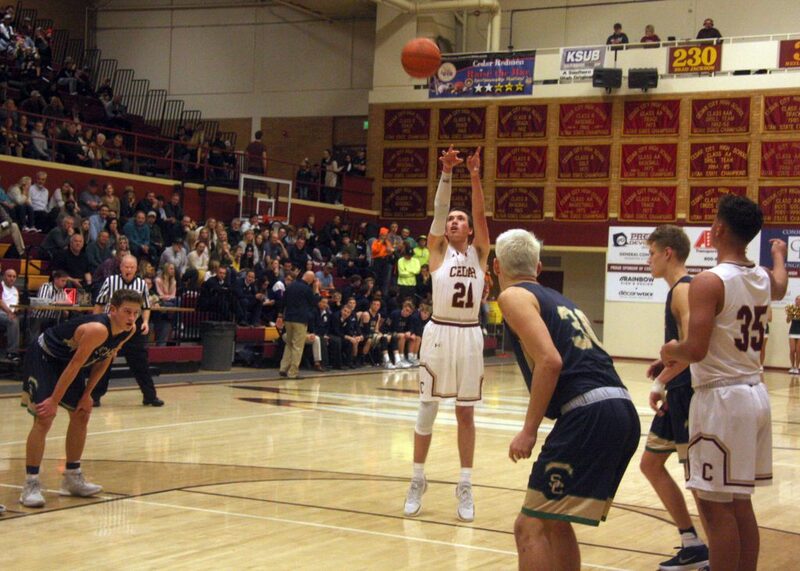 Midway through the third period, however, Snow Canyon started to close in, but the Redmen got a nice boost at the end of the quarter when Gaige Savage hit a 3-pointer at the buzzer to extend Cedar’s lead to eight points, 41-33. Although it was Savage’s only basket of the game, it provided much-needed momentum, the coach said. 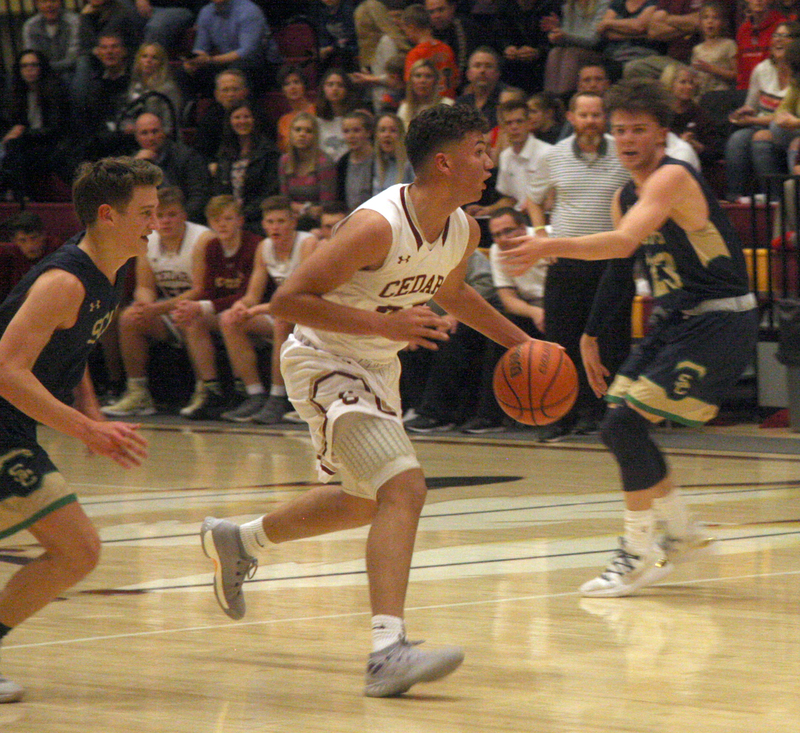 Guard Treyton Tebbs also scored 19 points for Cedar, including 10 points during the second quarter. Luke Armstrong added 9 as the Redmen improved to 1-4 in Region 9 play. Snow Canyon, which was led by junior guard Cole Warner’s 19 points, had no other players in double figures. Jakob Dunkley was the next high scorer with 8 points. The Warriors fell to 0-6 in region play. 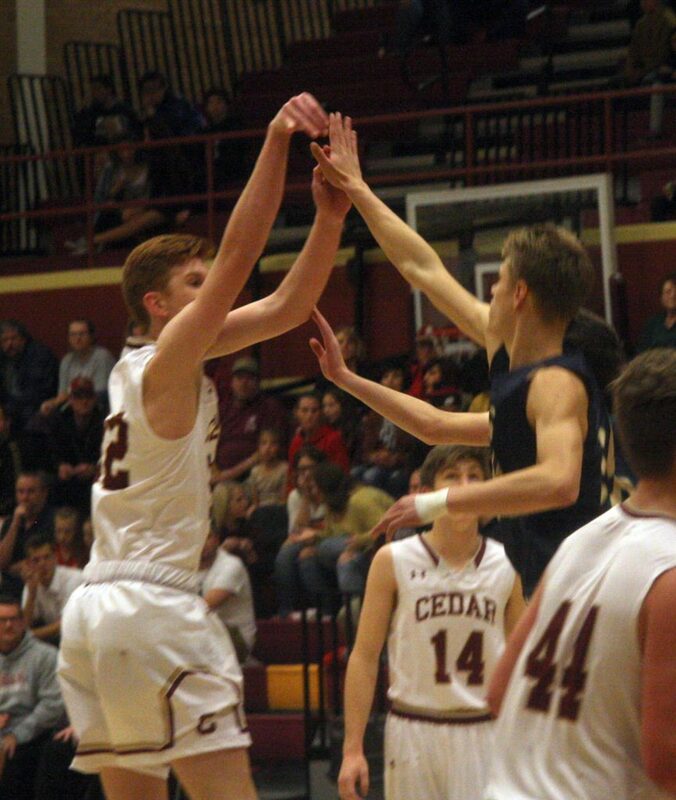 Cedar plays at Hurricane Wednesday at 7 p.m. Snow Canyon has a bye that night but will host Canyon View next Friday at 7 p.m. 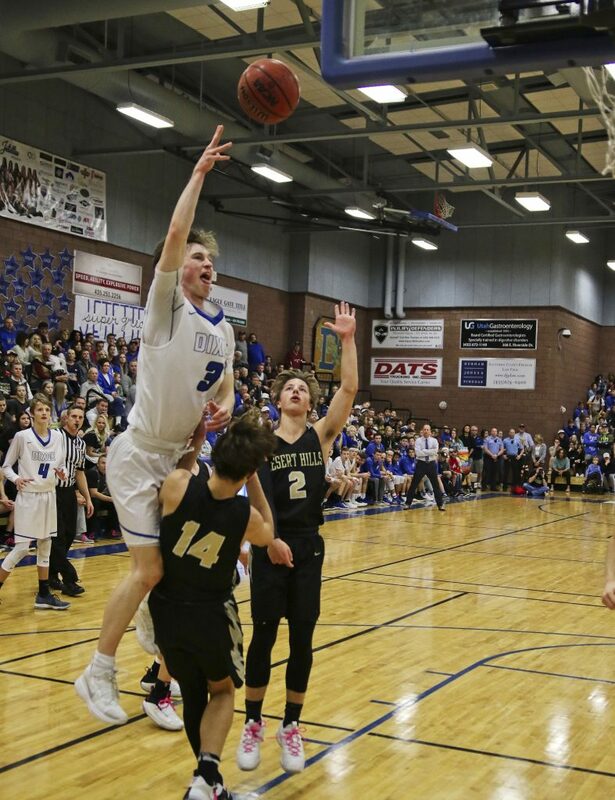 The Dixie Flyers, in a “fun Region 9 game,” overcame the Desert Hills Thunder to take sole possession of second place in the region. 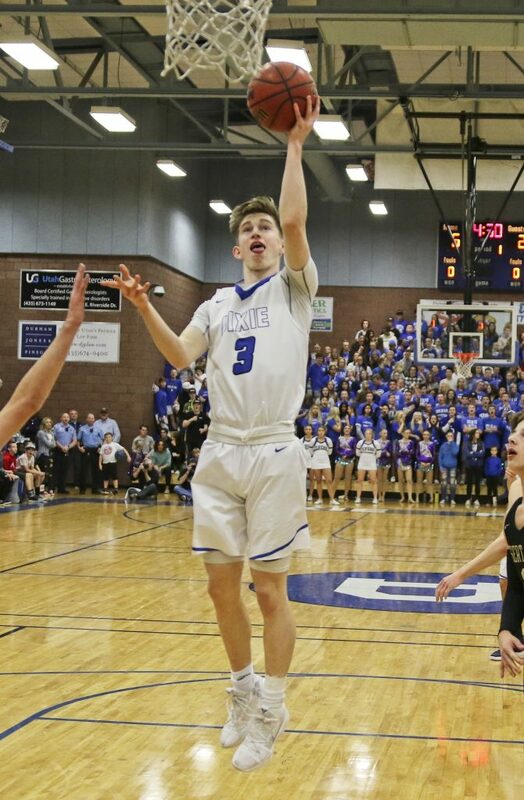 Dixie led by eight after one quarter thanks to 6 points apiece from Noah Lemke and Nic Roundy. The Flyers led by seven at the half and the Thunder cut the lead to five entering the final quarter, but Dixie was able to put the game away in the final period for the win. Hayden Cottle led a balanced offensive attack for the Flyers, scoring 11 points. Roundy added 8 points, while four different players added 6 points each. With the win, Dixie improves to 4-1 in region play. 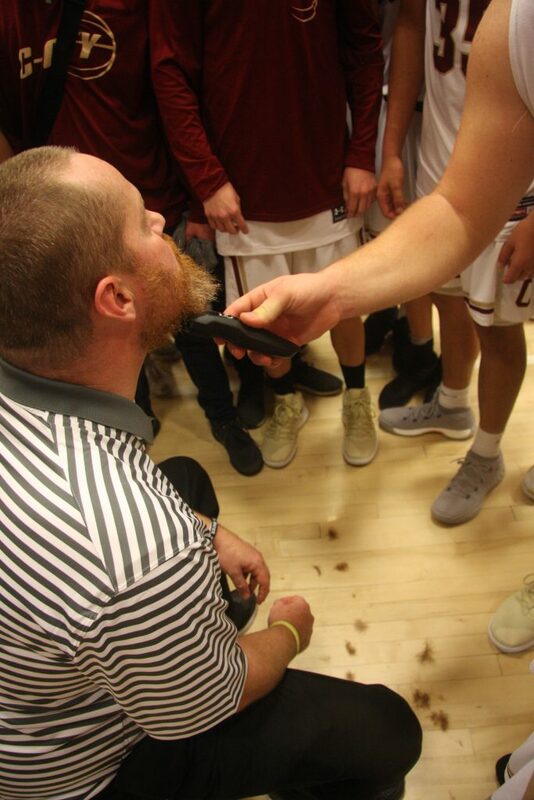 “It was such a fun Region 9 game,” Flyers head coach Tyler Roberts said. “Nothing better than a packed house watching two good teams battle back and forth. 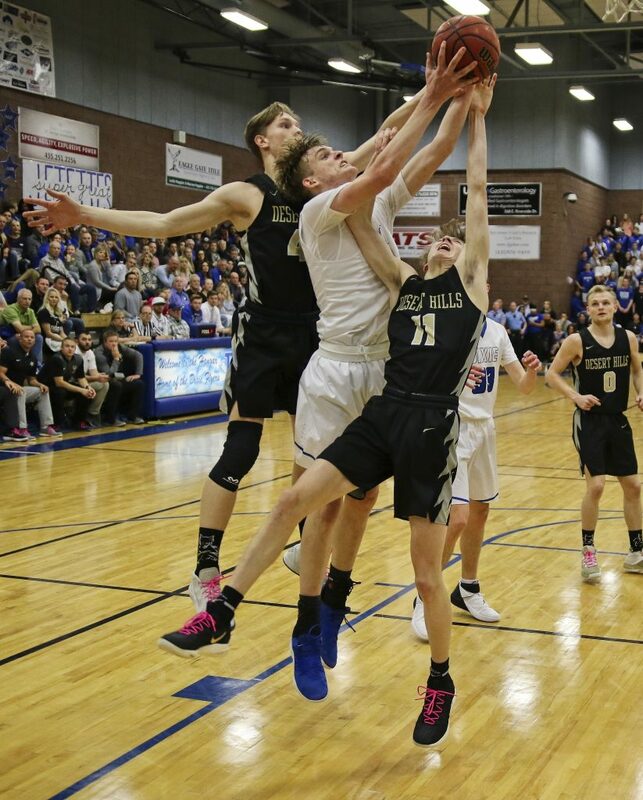 The loss drops Desert Hills to 3-2 in region play. 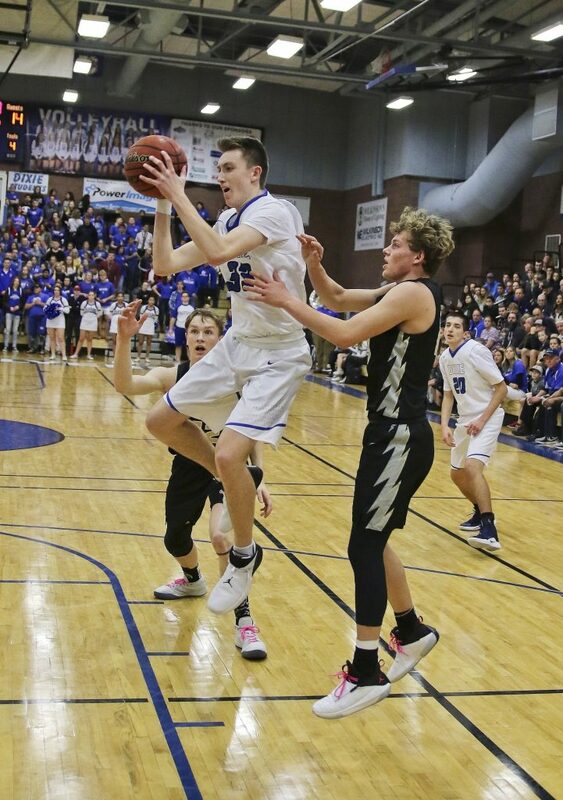 Carson Thornton led the Thunder with 14 points, while Trevin Lindstrom added 12. 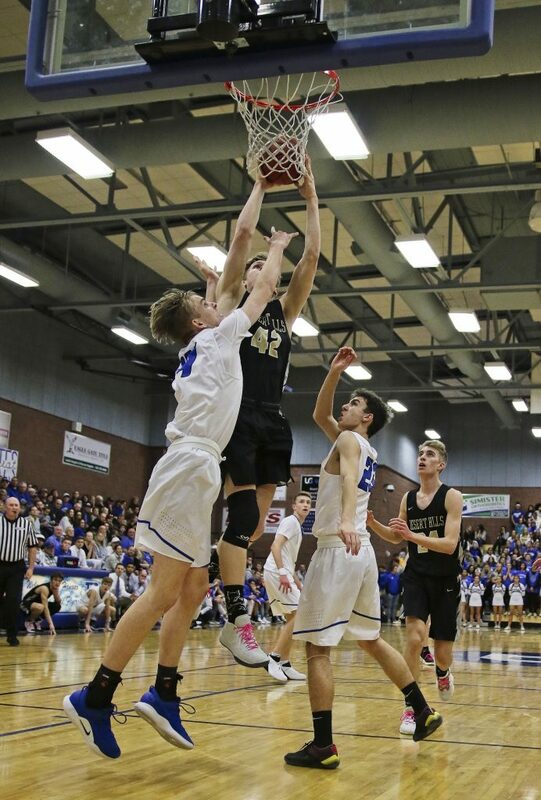 On Wednesday, Desert Hills hosts first-place Pine View. The game tips off at 7 p.m. The Flyers will face off with Canyon View, also Wednesday at 7 p.m. 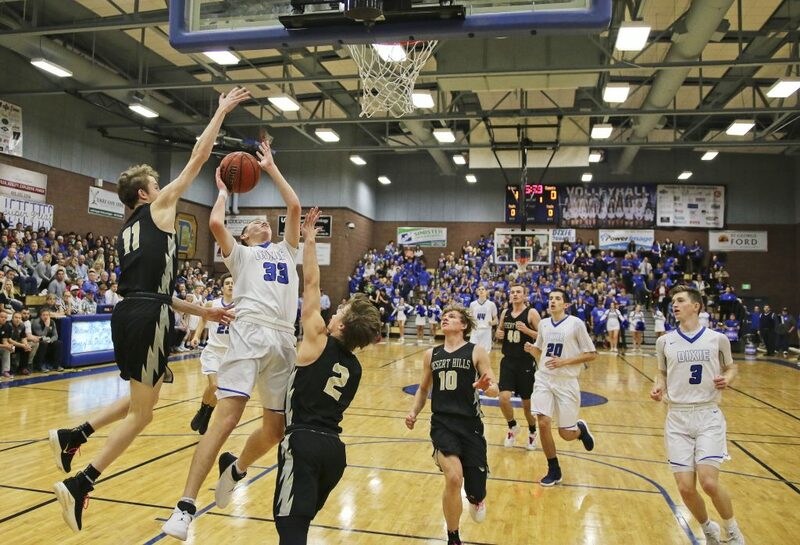 In a game they led from start to finish, the Pine View Panthers continued their undefeated start to Region 9 play, blowing out the Hurricane Tigers at home, 79-50. 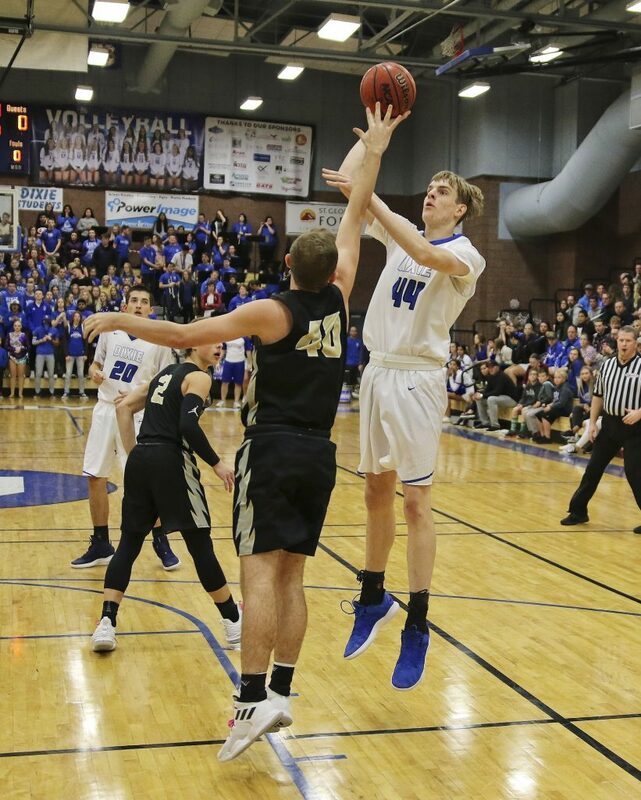 After leading by just three after one quarter, Pine View dominated the second quarter, outscoring Hurricane 25-8 and taking a 20-point lead into the half. The second half was closer than the first but the Panthers were never threatened in cruising to a 29-point victory. Michael Moore had a big game for Pine View, dropping 27 points while adding five rebounds and six assists. Dallin Brown chipped in 10 points for the Panthers. With the loss, the Tigers drop to 2-3 in region play, good for fifth place. They will play Wednesday at 7 p.m. against Cedar. Pine View will look to continue its hot start to region play against Desert Hills at 7 p.m. on Wednesday.